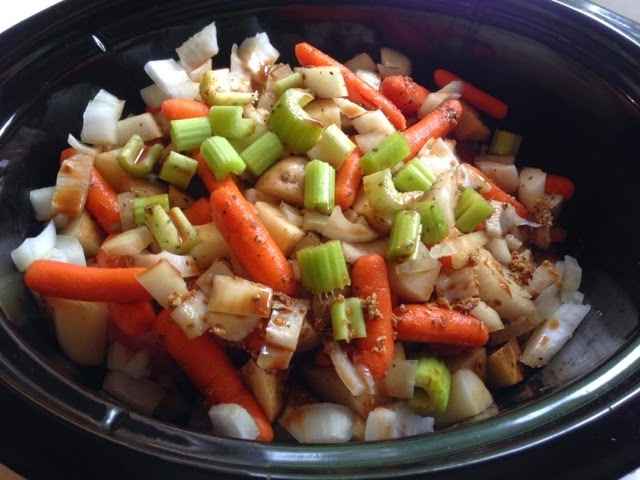 I don't know about you, but when Fall hits, I bust out the crockpot and cook as many cozy and warm foods as possible. It's also the time of year where we are the busiest, so it definitely helps to speed up (and simplify) the dinner process. Here were our meals from last week. Most of them are very simple and require few ingredients. Directions: We go to the butcher at our grocery store and have him cut a roast, so it's fresh and delicious. 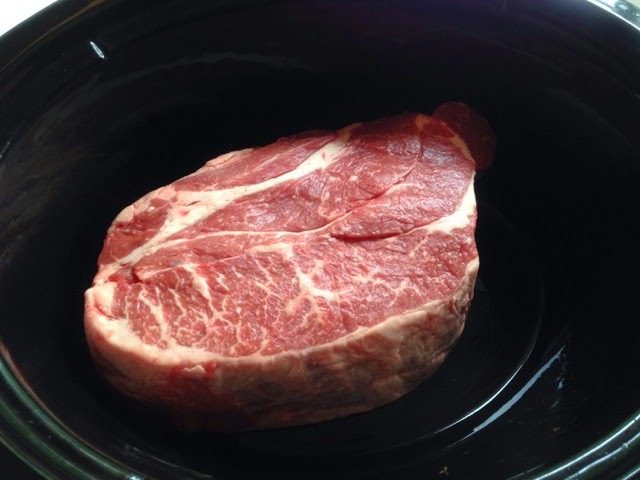 Some recipes say to sear the meat before putting in the crockpot, but I just stuck it in, because I was in a rush! What's new. 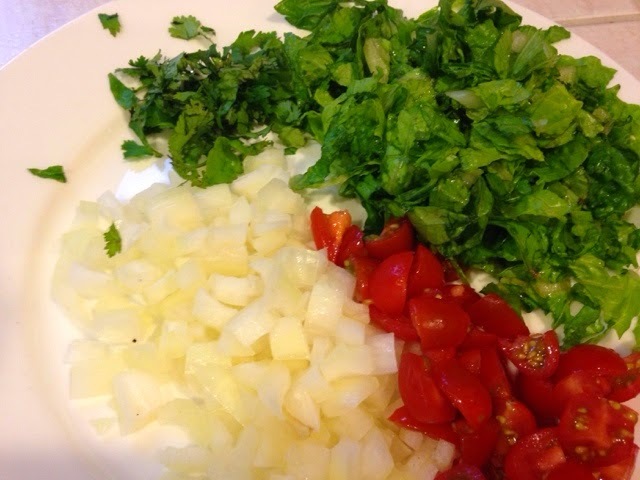 Chop up veggies and throw them in. 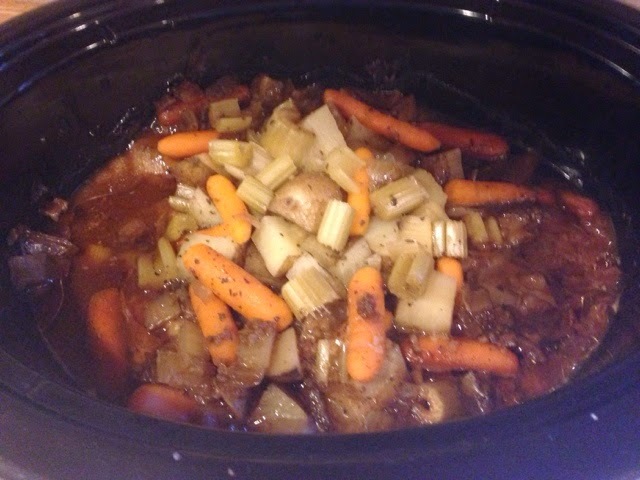 I used celery, carrots, Russet potatoes and onion. Pile them on to of the meat and then use a packet of onion soup mix with water, stir together in a separate bowl and dump on top. Stir everything together. 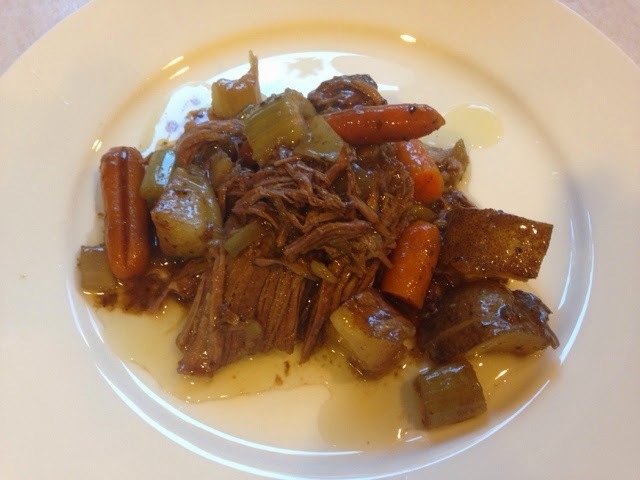 Turn crockpot on low and cook for 8-10 hours. You can tell I'm not a huge rule follower when it comes to meals. Guess, mix, pour and voila! ;-) You can't really go wrong with a roast. When it's done, the meat will literally just melt apart. Serve with hot fresh rolls and you've got yourself the perfect fall food. 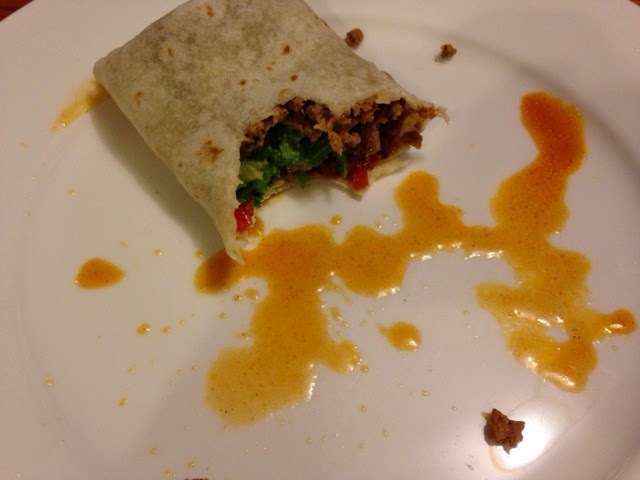 Directions: Cook ground turkey until no pink and mix in a taco seasoning and water. (Follow directions on the taco seasoning). 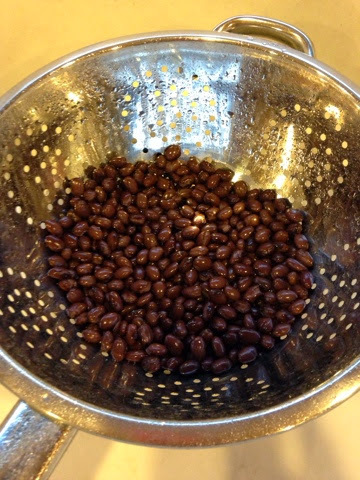 Drain and rinse black beans and chop all veggies. 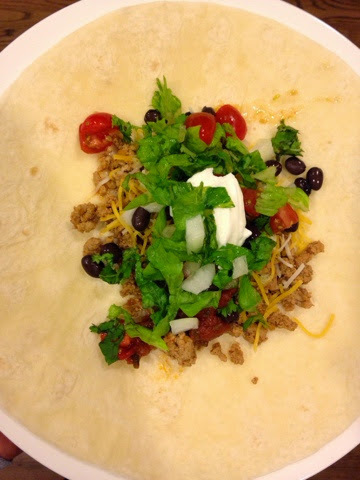 Put everything on a tortilla, roll up and serve. 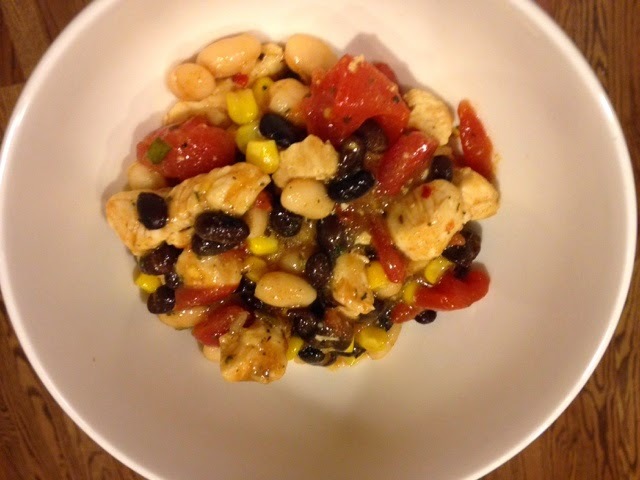 This happens to be my hubby's very favorite dinner, so we have it a couple times a month. Yum. Directions: Saute' chicken onion and garlic in oil until no longer pink. Add beans, broth, chilies and seasonings. Bring to a boil. Reduce heat and simmer uncovered for about 30 minutes. Remove from heat. Stir in sour cream and whipping cream. Serve. This is AMAZING! So good and so easy. 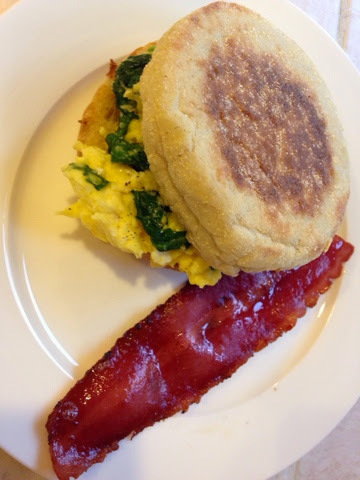 Thanks to my friend, Erica for this yummy recipe. Directions: Scramble eggs in a frying pan and before they are finished, toss in the spinach and shredded cheese. Continue to cook until spinach is cooked and cheese is melted. Toast English muffins and butter them. Put eggs in between two and serve like a sandwich. I cooked turkey bacon for the side, but you could do fruit or something else. The kids love this night and I love that I can hide veggies in their dinner without them even knowing. Sour cream, guacamole & salsa can be used as toppings. Directions: Line a cookie sheet with aluminum file, pour chips evenly across tray. 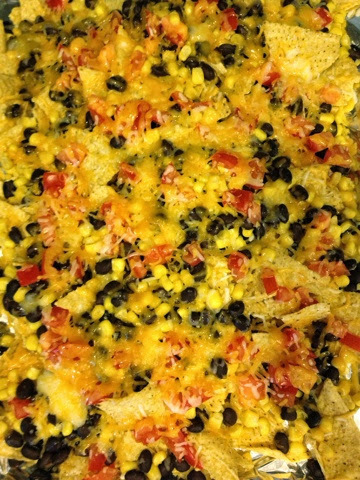 Coat with shredded cheese (use generously) and the rest of the beans & veggies. Cook at 350 degrees until cheese is melted. Approximately 8 minutes. Looks like you just planned my week! Thank you! Ha! You are so welcome! Fun seeing you are your cute little ones, today!! These all look amazing! I love seeing other peoples quick go to dinner ideas, so thanks for posting! Xo! 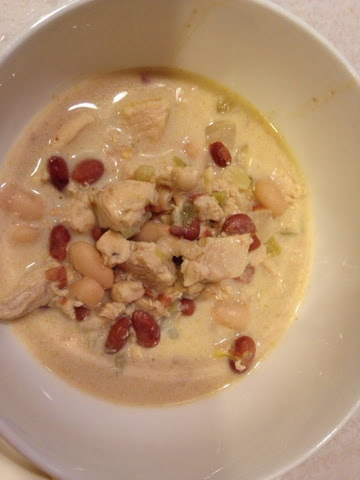 I'm going to make the white chicken chili soon!